Gerber Impromptu Tactical Pen 31-001880. Ready for action, this pen can write and defend. The pen itself is made of stainless steel and the pocket clip is stainless steel as well. 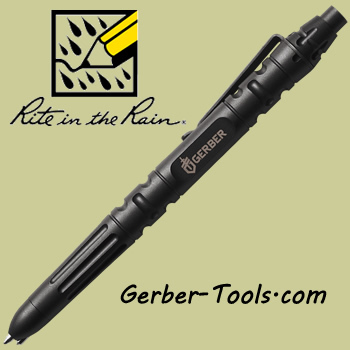 The ink catridge can write in the rain and in all weather, all angles, pressurized for precise writing. Need to write on wet paper? This pen can do it! Black color. Integrated glass breaker at the tip of the pen. Rite in the Rain. Proudly Made in the USA.